Every man has his own ideas about his perfect yacht. The boat of one man's dreams is that of nightmares to another. The young guy who commissioned this design was set on sailing to faraway places in a minimum boat, what could be termed a "vest pocket cruiser". She was to be named "PIEPOWDER", an old English word derived from the French for "dusty feet" and meaning wanderer. His father diverted him into the suit and tie world before his dreams became a reality. I wonder if he will ever realise those dreams. Despite her minute size, PIEPOWDER is designed as a serious cruiser. Her purpose presents a few problems not encountered in larger designs, such as maintaining aesthetics while providing usable interior space. The major problem was the design spiral one get's locked into due to the need to carry sufficient stores for an ocean crossing. A large single handed yacht can sail Cape Town to St.Helena in under 10 days and needs stores for that period plus some reserve. A smaller yacht will take longer so it must carry more stores. The smaller the yacht, the slower it will sail so the more stores it must carry. The more stores it carries, the slower it will sail and so on. She is designed for Airex cored GRP construction and has foam bouyancy distributed throughout so that, even if holed when fully laden for cruising, she can only sink about 300mm below her designed waterline. 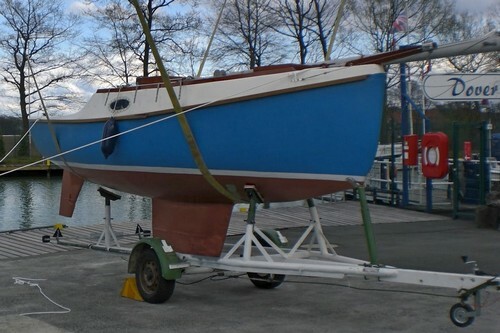 She has 350kg of bolt-on lead ballast low down with a fin keel/skeg rudder configuration and a raised sheer. The result is full self-righting capability with positive stability to 150 degrees. Her rig is cutter with single spreaders. The genoa is on the bowsprit and the staysail on the foredeck. In bad weather she would be sailed as a sloop using the staysail and reefed main. "Nano", waiting for her rig to be raised. Below she has port and starboard quarter berths for use at sea and a large double for use in port. The forward ends of the quarter berths double as seats for working or relaxing below decks. A small gimballed camp stove and a plastic basin provide a rudimentary galley and the cedar bucket would be stored under the bridge deck. Her raised sheer/flush deck configuration gives a large and clear foredeck. The cockpit well is small, drains through the transom and has liferaft stowage under the aft deck. Forward of the well is a broad bridge deck which forms a lounging area. For those wanting to sail in protected waters, the tankage can be omitted and a portable head built in under the aft end of the double berth. A curtain forward of the galley would provide privacy, making her a comfortable camp cruiser for a small family. Follow these links to a stability curve and list of drawings for this design. 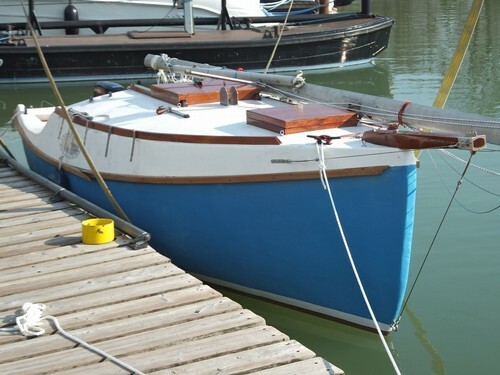 She is a very basic little boat with very few drawings,so we don't offer a study pack for her.